Our Luxury Kitchen Accessories Sets are sophisticated and striking to help you add the finishing touches to your very special environment. We specialise in hand crafting these luxury home accessories in a wide selection of amazing woods that are perfect for your super yacht too. 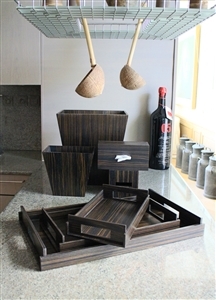 Elegant Luxury Kitchen Accessories in Dark Ebony. Gorgeous Luxury Kitchen Accessories in Warm Walnut. 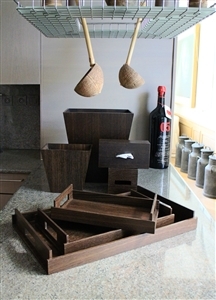 Contemporary Luxury Kitchen Accessories in Smoked Oak. Incredible Luxury Kitchen Accessories in Mexican Ziricote. Exceptional Luxury Kitchen Accessories in Tamo Ash. Stunning Luxury Kitchen Accessories in Karelian Birch. Every kitchen requires its finishing touches. 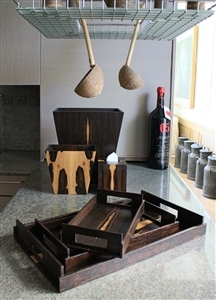 iWoodesign loves to design beautiful Luxury homewares and gifts in wood for your kitchen. Each item is lovingly handcrafted for you to enjoy and treasure. They make exceptional luxury gifts for men and woman and are a wonderful addition to any kitchen.